In the condom world, thin is in. The thinner the condom, the more natural warmth you can feel. Some men will not use anything else. It can be disappointing when you go to buy retail and not only do they not carry your favourite brand but they do not carry thins at all. 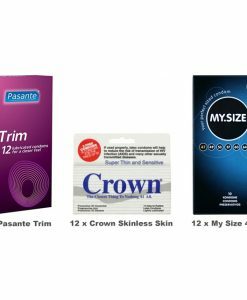 When you purchase the All Condom propriety Thin Condoms Value Pack you will know with confidence that you have the condom you want right at your fingertips. And because you bought on-line, they were delivered right to your door and you did not have to travel from store to store looking for them. You saved money on fuel as well as the condoms! 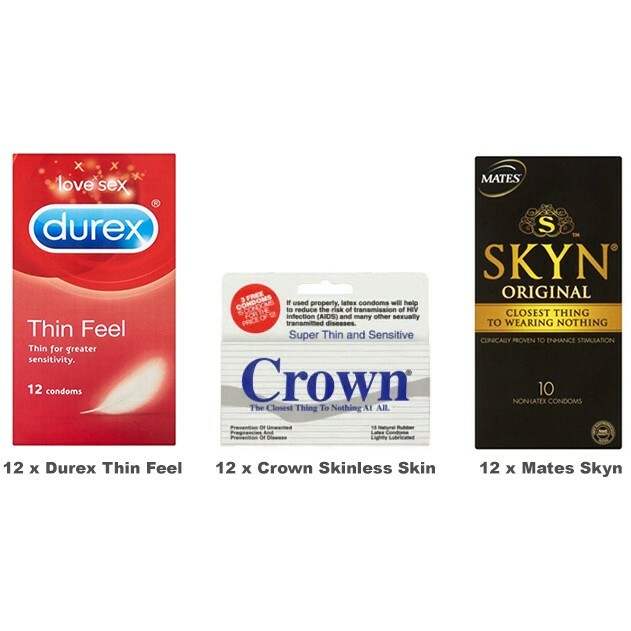 12 x Durex Thin Feel Condoms – Durex Thin Feel are lubricated, ultra-fine condoms for greater sensitivity. They are transparent, shaped and teat-ended and made from hypo allergenic natural rubber latex. They are also pre-lubricated. 12 x Crown Skinless Skin Condoms – Brought to you by the makers of Beyond 7, Crowns are manufactured from Sheerlon latex using the latest technology. A mere .04 mm thick, the Sheerlon can be made much thinner than regular latex and provides a super sensitive experience second to none! With a width of 52 mm, it is stretchy and yet remains incredibly safe. There is no more of a natural feeling than natural itself! 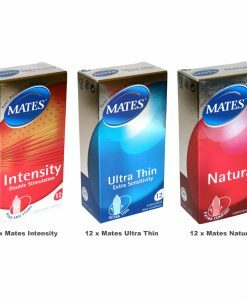 12 x Mates Skyn Condoms – This is the most sensual extra-sensitive condom on the market today without a doubt. Mates Skyn condoms are made of a revolutionary new material called Sensoprene, designed to be stretchy, soft and comfortable. The ultra-thin Mates Skyn condom hugs every curve, and its triple-tested design keeps you safe and secure at all times.